A District Where No Two Schools Are Alike School districts all across the country are breaking apart their traditional, large high schools. But once districts have thrown out the old, what becomes the new? The Mapleton School District near Denver offers just about everything. Mapleton students are not to be used as guinea pigs. The district only uses research-based models developed by nationally recognized groups, such as the Coalition of Essential Schools. The school district's motto? Give parents the maximum choice, and let them choose the style that's best for their kids. One high school embraces the Expeditionary Learning model developed by Outward Bound, which encourages yearlong exploration of a topic in great depth. Another school takes a more traditional approach designed to prepare students for the International Baccalaureate program. Yet another focuses on developing leadership skills. There's also an early college program, which allows students to take community college courses for credit. Chris Carithers teaches a class on Voltaire's Candide at the Mapleton Expeditionary School of the Arts. School districts all across the country are breaking apart their traditional, large high schools. But once districts have thrown out the old, the question is: What do they offer instead? For the Mapleton School District near Denver, the answer is just about everything. 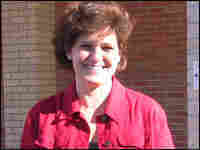 Charlotte Ciancio grew up in the Mapleton schools. Back then, the system had a dropout rate of more than 50 percent. When she came back to be superintendent of schools here in 2001, that statistic still held true — and she knew that had to change. "We've had that graduation rate for years. We just never really talked about it," Ciancio says. "So I knew that was happening here. My brothers and sisters graduated from school here." In fact, Ciancio decided, the entire 5,500-student system needed a shakeup. So she toured the country looking for models — and for partners. She says she had one guiding principle: "In Mapleton, the kids were not to be used as guinea pigs. ... Anything I implemented here had to be proven practice, and had to be research based." With that in mind, Ciancio threw the deck of cards up in the air and has reshuffled every school, creating 17 distinct programs. They are as different as schools can be. Seven high schools have replaced the district's single, large high school. Welby New Tech, with 286 students, was the only building the district could afford to rehab. 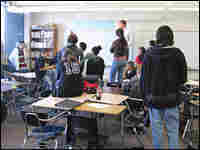 There are computers everywhere, and classrooms are large to permit team teaching. Bill Nelson, in his second year teaching at Welby New Tech, says the program is tailored for students who want to learn on their own. "I mean, I make lectures, and talk for 30 to 40 minutes before people back in Iowa," Nelson says. "But if I talk for more than 15 minutes in to these kids, they want to get busy. They want to do something." The school is based on New Tech High in Napa, Calif., one of the schools Ciancio visited while on the search for models. Welby works for self-motivated techies. But where do you go if you're more of a traditional learner? Just three miles north, Ciancio walks into a building that housed a struggling junior high just two years ago. "This is York International; it'll be a K-12 school," Ciancio says. "It's currently a K-9, so we have freshmen here. This is uniform school, so the kids are in uniform dress code." Compared with Welby New Tech, everything at York is more buttoned down. Once again, Ciancio says she is responding to a demand in the marketplace. "This is a traditional delivery school," she says. "It's an International Baccalaureate Candidate, so people who are very involved with their kids and are looking for a more private-like experience would be here." 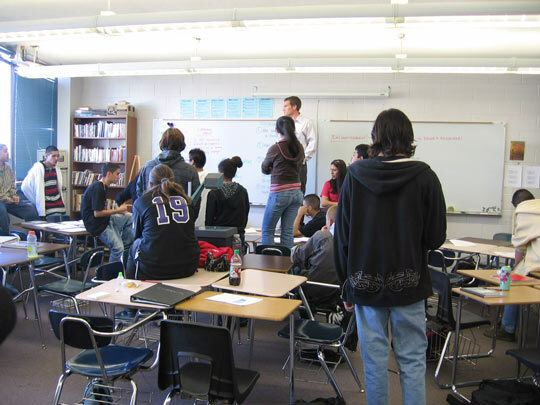 The lessons look more traditional: Students sit in desks, following the teacher. As Ciancio puts it, there's a lot of paper-pencil activity. Mapleton is trying to offer a broad menu of school experiences, but its system operates under the assumption that families will take advantage of the variety offered. Many students, however, say they're at a particular school "because my cousin goes here." Others say they want to leave a school because they don't like the uniforms. Ciancio acknowledges that some people simply choose schools based on convenience. But she's working on spreading the word, so families can make more-informed decisions. The startling degree of choice here slaps in the face when you enter the old Skyview High School, which once served 1,400 students. The building now holds a Montessori pre-school, and two high schools with different approaches to learning. One of those is MESA, Mapleton Expeditionary School for the Arts, perhaps the most progressive offering in Mapleton's educational department store. "We wanted to demonstrate that progress education could do a successful job of preparing poor kids and kids of color for college," Principal Michael Johnston says. You see that approach in Chris Carithers' class on Voltaire's Candide. Here, students will explore the Enlightenment by taking on topics such as free will and destiny as personal issues. The wide variety of colors in Mapleton's palette has attracted plenty of attention — and garnered a lot of foundation money. The Gates Foundation kicked in $2.6 million. But all these choices have not gotten standardized test scores out of the cellar. "Oh they're terrible, they're embarrassing," Ciancio says. There are small signs of progress, but overall, Ciancio's reforms have yet to deliver on the promise of higher achievement. Like others experimenting with small high schools, the Mapleton School District still can't say whether small is beautiful.